Brought to you by Common Man Games. 2 Cards from the Crime Scene Deck — Nothing Yet — Both of these cards are of the “Nothing Yet” type, which means that they are NOT actual evidence. By adding these to the deck, players will make it MORE difficult to win. The deck currently includes 8 Nothing Yet cards. By adding these cards, a 9th or even a 10th “Nothing Yet” card is possible. 7 Cards from the Murder Weapon Deck — Nothing Yet — All 7 of these cards are are of the “Nothing Yet” type (NOT actual evidence). Once again, by adding these to the deck, players will make it MORE difficult to win. The deck currently includes 7 Nothing Yet cards. Now, adding an 8th, 9th, 10th,… (All the way up to a) a 14th “Nothing Yet” card is possible! Including some (or all) of these extra cards makes the game more difficult to win! 3 More Cards from the Murder Weapon Deck — Each is a Different Murder Weapon — One is a knife (the knife used in the 1st Edition), one is a service revolver (used in the 2nd Edition), and one is a shotgun (not used in any edition — yet). We have heard feedback from gamers expressing a desire to have more variety in the area of Murder Weapons (these cards are done in answer to this — they are also done to allow for a greater range of deck set-ups). For details, see variants section below. This Promo-Pack requires NO special rules. All of the new Event Cards (Larger Cards) included in this expansion booster pack are intended to be used with any edition of Police Precinct, by simply adding the cards to the deck and playing as normal. With this in mind, feel free to play with ALL, some, or none of these new Event Cards. As always, follow the directions on the card as they appear. When playing with the Crooked Lawyers Expansion pack, it is possible for there to be more than one Event Card ending up in the same location. If and when this occurs, simply place the “New” card on top of the “Old” (Existing) card. The “New” Card must be dealt with first, and then once this is complete, the “Old” card can be accessed. We feel that it would be best to, EITHER play with the base-game’s “Problems In the Hood” series of cards (which is 3 cards, all of the same type), OR to play with the New “In The Hood” series of 3 different cards (the last 3 cards listed in the contents section above for Larger Cards). As for the Smaller Cards from the investigation decks, play will be conducted exactly as usual, but with some variation in terms of set-up. See below for certain suggested variants for these cards. In this scenario, it is considered that a number of weapons were used for illicit purposes and then hastily stashed in the neighborhood (available to be found by the Police). SET-UP: The focus is on weapons, so players would not use any of the extra Crime Scene cards provided. Instead, use ALL of the rest of the smaller cards (which happen to be from the Murder Weapon Deck). The only card you will want to NOT include is the duplicate Murder Weapon (which varies depending on which edition you are playing with — 1st Edition is a knife, and 2nd is a service revolver). Thus, you should have 8 original cards, plus 10 additional cards making a stack of 18 cards total. Then after removing the one duplicate weapon, you are left with 17 cards. Now randomize this stack. Then place and use as normal. MISC. : In this variant, players will be more likely to run across the murder weapon than is the case for the standard version of the game, but since the stack is much taller, they will have less control over the process. Overall, we this variant as slightly easier. If using a Dirty Cop, beware because this will make his job just that much easier. FOUND: Fortunately for the cops, the first weapon found is verified to be The Murder Weapon. At that point, the deck is then removed from the board (as is typical for this deck). In this scenario, it is considered that one group of detectives began work on the case earlier and that the new group (the group sitting down to play now) is taking over where they left off. SET-UP: players would set up the deck just as described in the Murder Weapon Frenzy above. Then the players would begin flipping over cards until a weapon is found. After this occurs, one more card is removed (but not seen by any players). All of these cards are to be put back into the box. Then play as usual, BUT none of the players will know if there are 2 or possibly only 1, murder weapon left in the game deck. MISC. : The fact that none of the players will know how many weapons are in the stack, makes it more challenging, but remember that in most cases there are will be 2 left, along with (likely) several of the Nothing Yet cards already removed. This will create a situation that is, on average, harder to win than is the case for the standard game. This variant is also fertile ground for Dirty Cop activity! In this scenario, it is considered that evidence is harder to come by for various reasons. SET-UP: players would use both of the extra Nothing Yet cards for the Crime Scene Deck (thus 10 total Nothing Yet cards for that deck), along with three three of the 7 extra Nothing Yet cards for the Murder Weapon Deck (thus 10 total Nothing Yet cards for that deck also). Now randomize both of these stacks and place them (and use them) as normal. MISC. : In this variant, players will find it to be substantially more difficult to find the evidence and win the game. TAKE IT TO THE LIMIT: Remember, if you can succeed at this version, as described above, then please DO add even more cards to the mix if you want. The hardest possible scenario would involve using all of these extra (new) “Nothing Yet” cards from BOTH the Murder Weapon Deck AND the Crime Scene Deck, while using none of the extra cards from the Murder Weapon Deck which are actual pieces of evidence (so limiting the evidence to JUST ONE murder weapon — exactly like how it is done with the normal base-game). This will result in 15 total cards in the Murder Weapon deck (considerably more than the standard amount = 8), AND you will have 16 total cards in the Crime Scene Deck after adding in the 2 new Nothing Yet cards! Winning a game under these conditions could prove to be very difficult! We only recommend even trying this if your group is very advanced and enjoys extreme challenges! We here at Common Man Games know that some gamers like to follow pre-prescribed play-tested variants. That makes perfect sense and we love to offer them. We also know that some like to “Design-their-own” variants and create their own House-Rules. We think this makes perfect sense too. We want to support BOTH approaches and encourage fun in every form it might come. 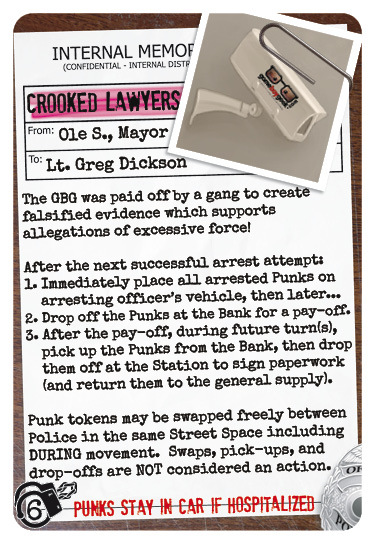 We plan to create a special thread on BGG designed for brainstorming ideas with YOU (the gamer) for even more fun ways to use the smaller cards from Crooked Lawyers. When we do, we plan to create a link here, so stay tuned! This promo-pack of cards was born during the Kickstarter for the 2nd Edition. It was an important part of the Stretch Goals for that campaign. Initially called “Naked Man”, it was then later changed to “Crooked Lawyers” (inquiring minds go GO HERE). Crooked Lawyers is considered to be an Episode in the Police Precinct series, to see how it fits into the line-up GO HERE. DAN KING — Made an appearance in this episode with his Card, which became the Name-Sake of this promo-pack. Originally the card was to be named “The Sting”, but later renamed “Crooked Lawyers”. If you want to follow the evolution of this card GO HERE! RICHARD LAUNIUS — Appears in the form of inspiration for a number of cards. 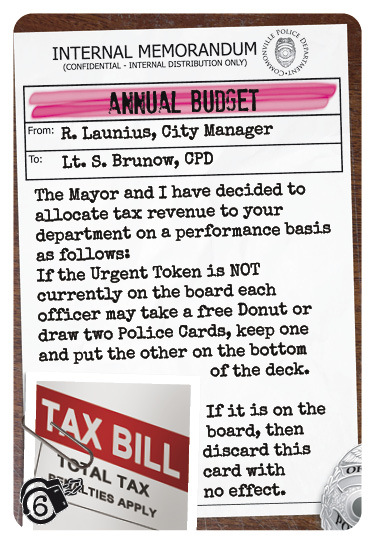 When we found out that game designer Richard Launius had designed a whole set of special cards for his personal copy of Police Precinct, we asked if it would be OK for us to use part of this collection in Crooked Lawyers. Sir Richard has graciously allowed this happen. BART “THE CHIEF” BRUNSCHEEN — Bart is well known in the industry as a reviewer for The Dice Tower. We would also like to point out that Bart is a REAL COP! In fact, he is a highly trained and experienced veteran who is a part of our pool of Law Enforcement Consultants. Throughout his career, Bart has been involved with some VERY interesting situations. One of which gave him a degree of fame (video footage went viral) for his foot-pursuit of a car driven through a building. Bart also has many well-told and amazing stories of such things as… how tricky it can be to attempt to apprehend a naked perp. As he says, it’s a no-win situation! This inspired one of the cards known simply as “Naked Man”, which at one time was going to be the name-sake of the Promo-Pack. We held a contest to design-a-card, to see the results, GO HERE. To learn more about ALL the people who make Police Precinct possible in all sorts of ways, GO HERE. MORE CARDS: To see ALL the Larger Cards, go HERE! TIMING: Learn more about release schedules by going HERE! PRICING: This item is not for sale yet, and no MSRP has been determined. COMPARE EDITIONS: Crooked Lawyers is being released in conjunction with the 2nd Edition of Police Precinct. To compare the 1st & 2nd editions, GO HERE! BGG PAGE: Yes, we did create a product page for this item over on BGG! VIDEO #1: To see a Quick-One about the Larger Cards GO HERE! VIDEO #2: To see a Quick-One about the Smaller Cards GO HERE!